27 is the debut single from Norwich four-piece Kaves. 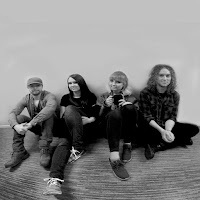 Only formed in June of last year, they've already sold out their debut gig at their hometown Waterfront studio venue and had repeat plays on BBC Introducing in Norfolk. 27 is a brilliant three minute pop song with a chorus that'll stick in your head for days after listening to it but which is anything but throwaway, touching on a whole boat load of influences whilst retaining an original sound and personality all of its own. It's a mightily impressive debut that has us excited about what they'll do next. Kaves are Emily Rudd on vocals, Tim Frost on guitar, Mia Webster on bass and Matt Dove on drums. Kaves' official website can be found here and they are on Facebook and Twitter.